Happy (belated) Father’s Day to all fathers out there! woke up early yesterday to make these pancakes for my awesome dad and the family loved it (: Kudos to Evan’s Kitchen Ramblings for identifying this fool-proof recipe from YouTube. Below is the recipe with some of my own amendments. 1. Sift flour, baking powder & salt in a bowl and mix well. 2. In another bowl, whisk together egg yolk, sugar and milk followed by oil. mix well and add it into the flour mixture. Whisk to combine. 3. Hand-whisk egg whites until soft peaks form , then fold into the above mixture. I used a flat-based bowl to ensure that I whisked every bit of the egg whites. 4. heat griddle or a non-stick frying pan on medium low heat then scoop batter, about 1 ladleful onto the pan. cook until bubbles appear evenly on the surface, flip it over and cook until golden. Throw as many blueberries as you like into the saucepan/griddle used to make you pancakes. Let it sit for awhile and occcasionally stir it to prevent it from burning. Once you see that the blueberries have cooked and softened, you are ready! 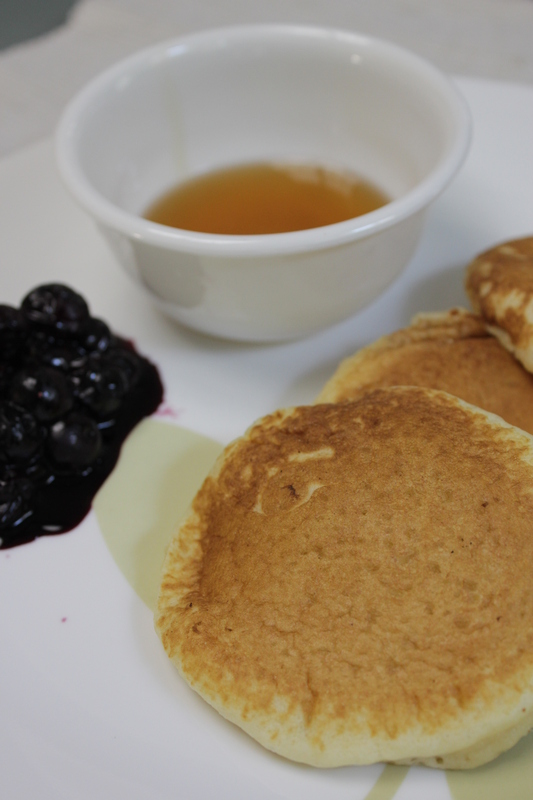 The fluffy pancakes went perfectly with the tangy blueberry compote and the sweet and flowery notes of wild honey. Next time, i’ll use wholemeal flour to add an extra nutty dimension to this wonderful recipe.